•Adaptive Compression, which allows you to reach higher compression ratios with DB2 10 than ever before. Learn how this new feature helps generate storage space savings, reduce physical I/O, and improve the buffer pool hit ratio so that higher throughput and faster query execution times are achieved. We'll cover the adaptive nature of the compression algorithm which helps ensure that compression ratios remain optimal over time, thus reducing the need for DBA intervention and data reorganization. •Multi-temperature Data Management which configures the database so that only frequently accessed data (hot data) is stored on expensive fast storage, such as solid-state drives (SSD), and infrequently accessed data (cold data) is stored on slower, less-expensive storage, such as low-rpm hard disk drives. As data cools down and is accessed less frequently, you can dynamically move it to the slower storage, helping to maximize storage assets. •Workload management which provides the ability to treat work differently, both predictively and reactively, based on the data touched. In 2012, we are delving into the technology behind the exciting new April 3rd announcement of the DB2 10 for Linux, UNIX and Windows product. 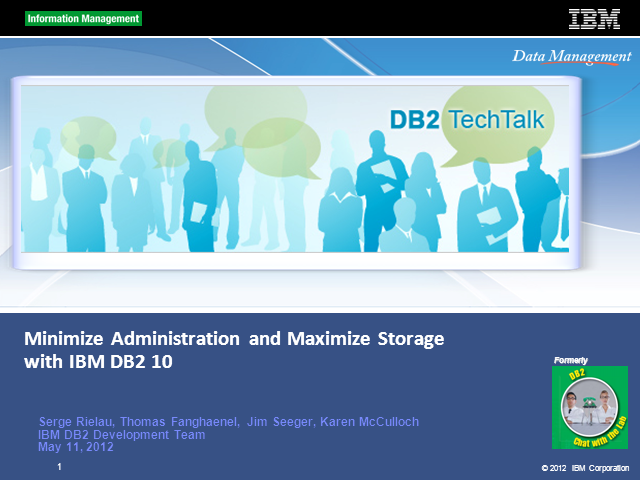 This DB2 Tech Talk, formerly know as DB2 Chat with the Labs, follows the April 26th Technical Tour of DB2 10 software.